The HX3008 DC-DC converter supplies all three voltages required by small thin film transistor (TFT) liquid crystal display (LCD) panels. 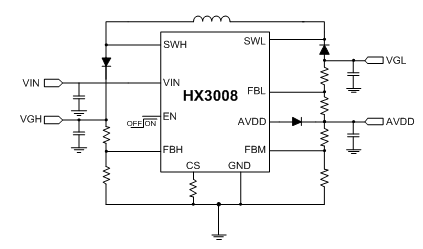 The compact HX3008 uses a single inductor to generate independently regulated positive and negative outputs. The main output, AVDD, is post-regulated to provide a low-ripple source drive voltage for the LCD display. The auxiliary outputs generate a boosted output voltage, VGH, up to 20 V, and a negative output voltage, VGL, low to -20 V for the LCD gate drive. The device has internal over-current protection cycle by cycle and thermal shutdown for high reliability during fault conditions. The HX3008 is available in a DFN-12L package.